We spent three days in Isafjordur and in those three days I felt like I saw three towns. One was a blizzard, with mountain peaks obscured in smoke and wind blowing in all directions. One was an icy wonderland, with crisp white peaks and pearly streets. The other was a mossy grassland, with melted snow and skies dark with rain. Imagine if I had only seen one town instead of three. 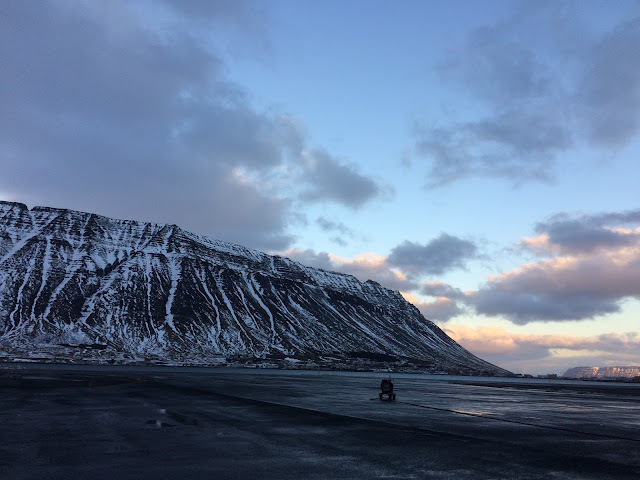 I am glad I went to Isafjordur. Even though we had to abort landing once. Even though our plane hung in the sky shaking for 40 minutes, while we waiting for the weather to clear. Even though the mountains looked menacing from the tiny plane window. Even though it was only light out for 4 hours. Even though the darkness nearly consumed me. Even though the weather caused our plane to be cancelled. Even though the cafe was closed on the weekends. Even though the bar was closed for private events both nights. Even though there was no good food to eat after a certain hour. Even though I slept 15 hours a day. Even though I had a mental breakdown in the library when our flight was cancelled. Even though I had another mental breakdown in our room when I thought our flight might be cancelled.